The spine is a complex structure that supports the skeleton and protects the spinal cord. The spinal canal is a tunnel composed of multiple vertebrae stacked on top of each other. Nerve roots branch out from the spinal cord through small openings between individual vertebrae called foramina. Once outside the spinal cord, the nerves travel to the various parts of the body. The spinal cord and nerves can become irritated when the integrity of the spinal canal and foramina are compromised. This occurs when a disc bulges posteriorly (toward the back) or when bone spurs develop on the lamina (the “roof” of a vertebra). Either of these scenarios, along with others beyond the scope of this document, will result in a significant reduction of space within the tunnel and the foramen where the nerve exits the spinal canal. When the spinal canal or foramen is reduced in size, the residing nerves are more prone to irritation. Patients with spinal stenosis may suffer from numbness and tingling, muscle weakness in arms or legs, and pain that radiates from the spine into the extremities. 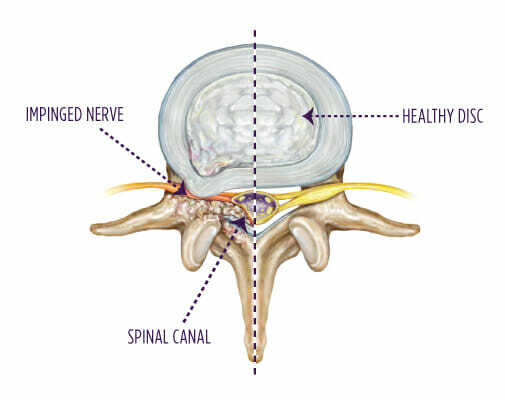 Symptoms of spinal nerve irritation are diverse in presentation and severity, and this only provides a generalization of the symptoms associated with this disorder. If nonsurgical treatments such as NSAIDs, physical therapy, and epidural steroid injections have failed to relieve your symptoms, your physician may wish to proceed with surgical intervention. Your orthopedic surgeon will make an incision near the center of your spine between two and six inches long. Through this incision, any bone spurs and damaged disc material are removed. Once the offending tissues are removed, the incision is closed with sutures. As you heal in the weeks following surgery, the muscles and ligaments of the back will fill in the space where the lamina used to be. These tissues are substantial and will provide protection of the spinal cord. Walking is encouraged after a laminectomy/decompression. But in the six weeks following surgery, excessive bending, twisting and lifting will be restricted. As the surgical date approaches, you will be provided more information outlining what to expect before and after surgery.